These curtains are beautiful. They appear to be a heavy weight linen. I have gotten many compliments on these curtains. i would recommend this item to buy. With a fun fresh take on energy efficiency, our SunSmart April Printed Botanical Blackout Panel is the perfect update to liven up any room. 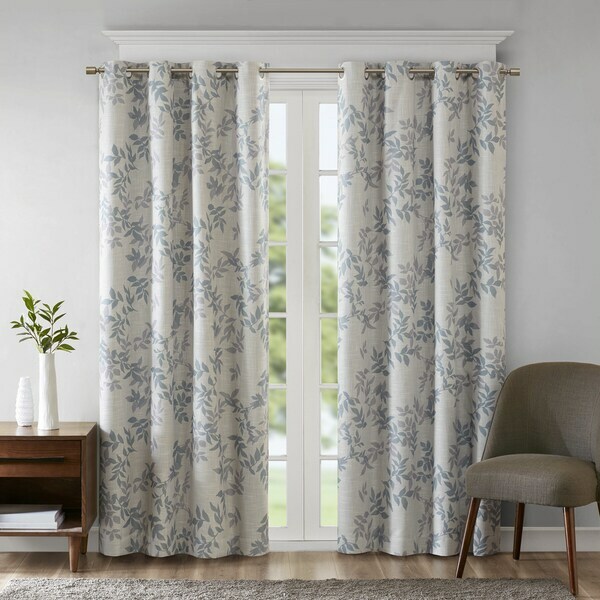 Featuring an updated botanical design printed in fresh and neutral hues, this blackout window panel is made from a textured polyester slub base fabric creating texture and dimension for a casual look. A one pass foamback finish with additional bonding on the reverse enhances the panel to buffer most sunlight, while also creating a significant barrier to reduce outside noise. Silver grommet top finish makes this panel easy to hang, open, and close throughout the day; while fitting up to a standard 1.25 inches diameter rod. Perfect for home offices, family rooms, and bedrooms, this blackout panel provides a high-level of privacy and considerable energy savings in a trend-setting style. Lighting level: Heavily Shaded Ambiance. Bought the one with yellow and expected the colors to be more vibrant, but they are actually quite washed off. The material is also thinning where it was folded. Not sure if I would buy this again. It blacks the room and provide privacy. Really nice curtains! Matched my couch perfectly. Great price! Madison Park Aramo 84-inch Single Curtain Panel - 50x84"